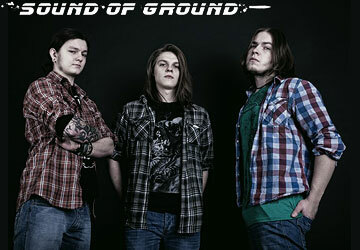 SOUND OF GROUND is a young stoner-band which was born in January 2010 in the heart of Russia, Moscow. Obsessed by buzzing sound of early stoner and grunge, as well as heavy riffs and melodic patterns of classical hard rock, three students in psychology – (from left to right) guitarist Danila Khromov, drummer & vocalist Ian Karlin, and Denis Makhnev on bass-guitar – are determined to make a mark in the uprising Russia's heavy-rock scene. There is nothing new under the sun, but if you like heavy and fuzzy songs with drenched vocals (all lyrics are in English) and evocative tunes, listening to this trio can be a very enjoyable experience. The first SOUND OF GROUND full-length album, Sky Colored Green makes its stoner-metal affiliations pretty clear. This is loud, riff propulsive, and fuzzy drenched excursion, featuring well measured balance between straight-ahead heaviness and psychedelic obscurity, as well as emotive, classic rock singing. Performed by Ian (drums, vocals), Danila (guitar), and Denis (bass). Graphic design by Mila Kiseleva. (11 tracks – 50 min.). All songs from the demo-EP R.H.S. (see'n'listen from below) are included. "Sound Of Ground aren’t doing anything new or different but have cranked out a decent set of fuzzed out stoner rock with a variety of influences, and I’ll give them credit for injecting some variety across these songs. They seem like a young group of musicians and have only been together since January 2010 so I’ll be watching their progress with interest." – by Jerry Kranitz of Aural Innovations (USA) (August 2012). 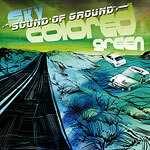 "Sky Colored Green is like a compilation of the most enjoyable moments in the wider area of heavy rock, packed up and well-crafted with passion and affection. From the weedy psych stoner territory of 'Lips Of The Ocean' and 'Share' to the dynamic aggression of 'Reboiled' and 'R.H.S. ', SoG generously offer us listening pleasure material." – by Thanos Aronopoulos of Downtuned Mag (Greece) (September 2012). "There are elements of of Yawning Man, or Unida or other acts in the Californian desert milieu, but basically, Moscow’s Sound of Ground sound like Kyuss. They know it. Their debut full-length, Sky Colored Green, makes no attempt to hide it, whether it’s the 'Green Machine' riffing of 'Lips of the Ocean' or the speedier Slo-Burnery of 'El Caco', though the metallic screaming on 'R.H.S.' is a dead giveaway for the band’s youth, coming off more like early Down than anything Josh Homme ever plugged in to play. While not necessarily original, the trio are firm in their convictions, and Sound of Ground tear through these 11 tracks with engaging abandon. The Russian scene continues to intrigue." – by H.P. Taskmaster of The Obelisk (USA) (October 2012). 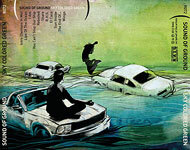 The album was also reviewed at: Muzikreviews.de (Germany), New Underground Music (The Netherlands). 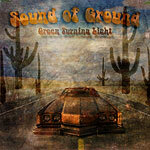 Green Turning Light is a debut EP-release by SOG. Recorded, mixed and mastered at the Muzei Zvuka Studios, Moscow in August 2010. (6 tracks - 21 min.). Read about: Darkside (Russia), The Mean Man (Spain), A Distant Rumble (USA).